Skin cancer is the most common form of cancer, affecting an estimated 1 in 5 Americans during their lifetime. Sun exposure and exposure to tanning beds increases the risk of developing skin cancer. While skin cancer can affect people of all colors and races, however, people with fair skin that sunburn easily generally have a higher risk. Types of skin cancer include basal cell carcinoma, squamous cell carcinoma and malignant melanoma. Melanoma is the most deadly form of skin cancer. More than 75% of all deaths from skin cancer are from melanoma. Fortunately, skin cancer is highly treatable when detected early. Detecting skin cancer during its initial stages greatly improves the outcome of treatment. That is why it is so important that the skin is checked annually. Any spots or moles that are different then others, or that change, itch or bleed should be reported to a dermatologist immediately. The arms, underarms, hands, legs, feet, the back of the neck, the scalp, the back and buttocks should be checked for changes at least once per month. It can be difficult to spot changes on hard to see areas of the body. This is why our board certified dermatologists offer full body skin cancer screenings. Mohs Micrographic Surgery is a type of surgery used to remove skin cancer from areas of the body that have a limited amount of tissue. Common areas treated include the ears, nose, lips and around the eyes. Mohs Surgery involves the removal of skin cancer one layer at a time. The layers are examined under a microscope immediately after removal until there is no sign of skin cancer cells. This procedure is extremely effective and reduces scarring, allowing for better aesthetic results. Surgery is the most common treatment for basal cell and squamous cell skin cancers. Surgical options include excision, physical destruction and Mohs Micrographic Surgery. 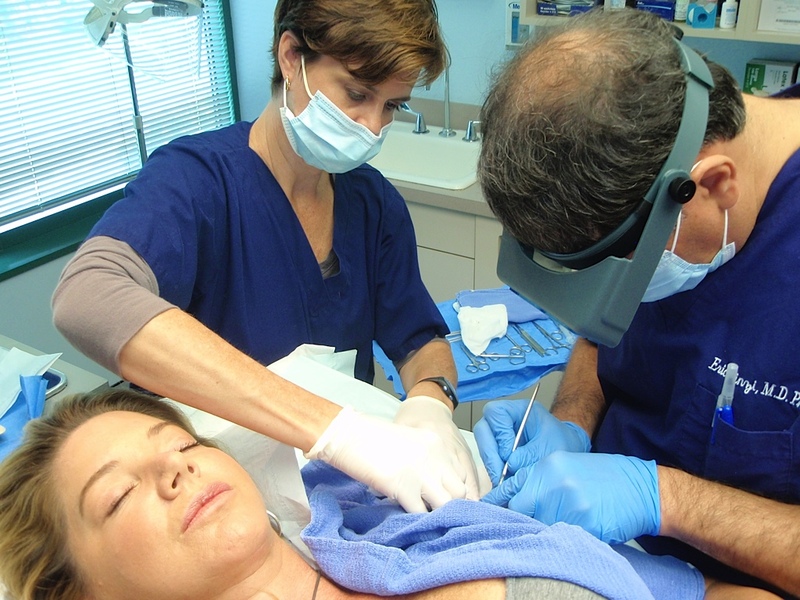 Non-surgical options include Cryotherapy, Photodynamic Therapy using Levulan and topical chemotherapy. The type of procedure used depends on the type of skin cancer, the size of the area affected and where it is located on the body. Skin grafting and reconstructive surgery might be necessary after removal of large basal or squamous cell cancers. Actinic Keratosis are pre-cancerous growths that commonly appear on the hands, forearms, head and neck. These dry, scaly patches form from years of sun exposure. If not treated promptly, AK can progress into squamous cell carcinoma. During a skin cancer screening a medical professional visually inspects the skin for signs of skin cancer. These screenings can also be useful in identifying individuals that have an increased risk of developing skin cancer. Screenings take only minutes to complete. Our qualified, board certified dermatologists offer full body skin cancer screenings. Our dermatology team specializes in the prevention, detection and removal of skin cancer. Skin Cancer Screenings Saves Lives - Call 240-482-2555 for an appointment today!